In this text we will analyze the football matches from the point of view of the scored goals after 80 minutes. 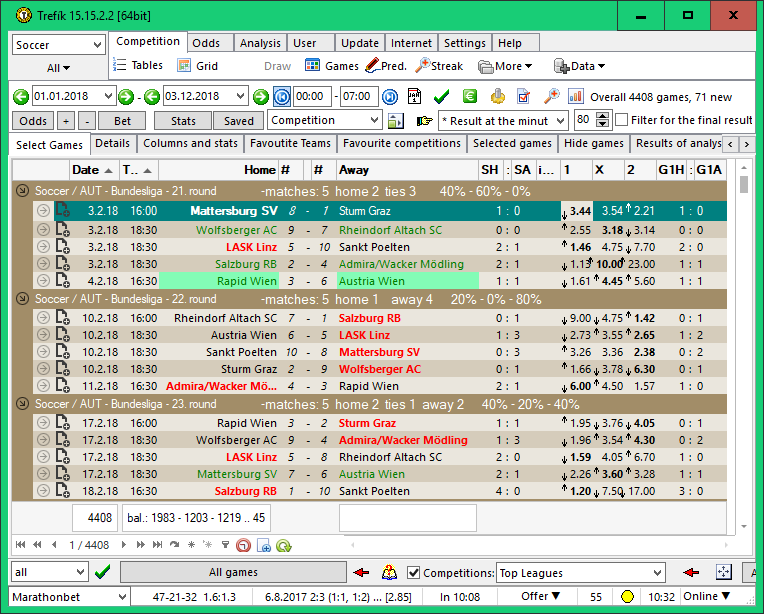 The results of this analysis can be used especially for live betting on matches. Only competitions that are awarded in the Trefík by goal-scorers in matches are suitable for analysis. 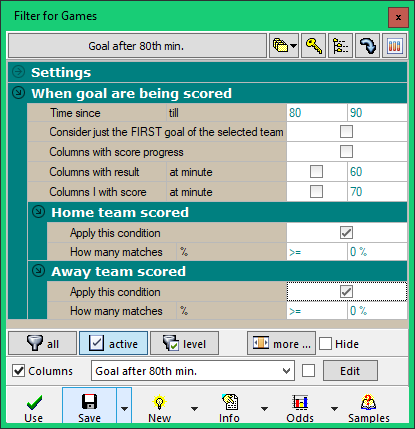 Then the times of the goals scored are available and the analysis can be made. 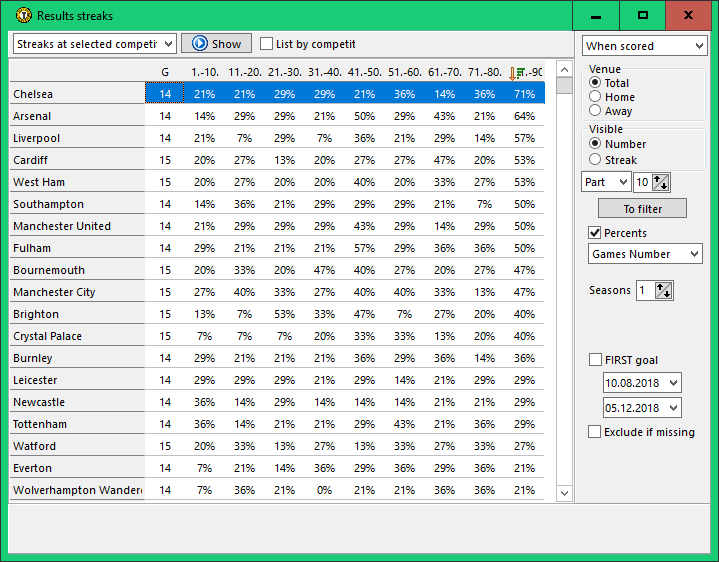 Goalscorers are available in Trefík for all major competitions and probably for all competitions where live bets are offered during matches. The analysis can be done in Trefík in different ways. The functions in the Offer, Predictions and Streaks windows are suitable. Gradually, we will show all possibilities. Let's start with the most used Trefík window, the window Offer. 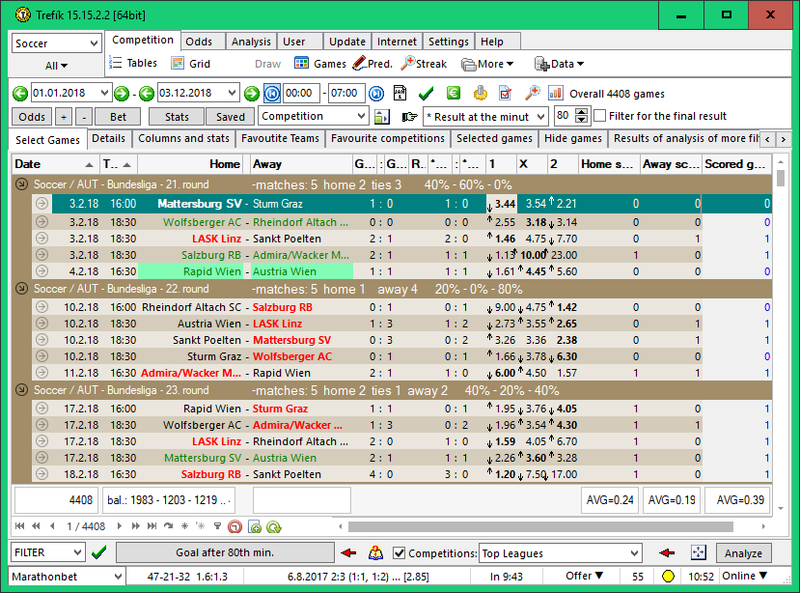 To display partial results after the specified time, use a special bet type: "Result at minute". 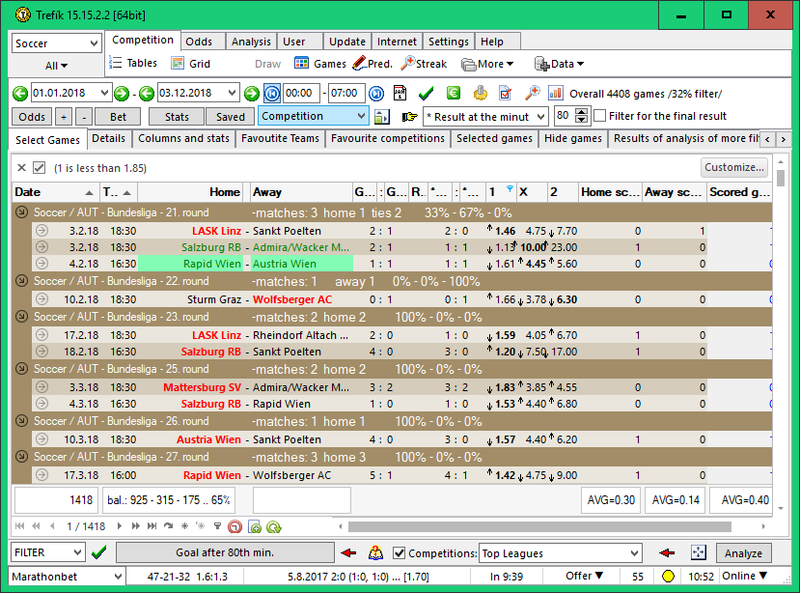 It is available from the menu to change the type of displayed odds above the list of matches. If we choose this type of bet, odds will remain on the final outcome of the match, regardless of the specified minute to which the result is to be displayed. The result at 80th minute is presented at the last two columns. By comparing the final result columns with the result in the 80th minute, we find out in which matches the goal was scored after 80 minutes. To compare the column values we can use the Offer / Filter section features. .. new columns are created to compare the numbers of both teams at the end of the match and 80th minutes. The NOT EQUAL function is used. This feature is used twice: for home and guest separately. If the values of the compared columns are different, the function "not equal" returns 1; in case of equality, 0 is returned. The last new column is called "SCORED GOAL" and compares the results of inequality tests for home and guest goals. This time the "OR" function is used. This returns a value of 1 if the value of at least one collated column is nonzero. In this case, the column will only be 1 if the home OR guests have scored the goal after 80 minutes. 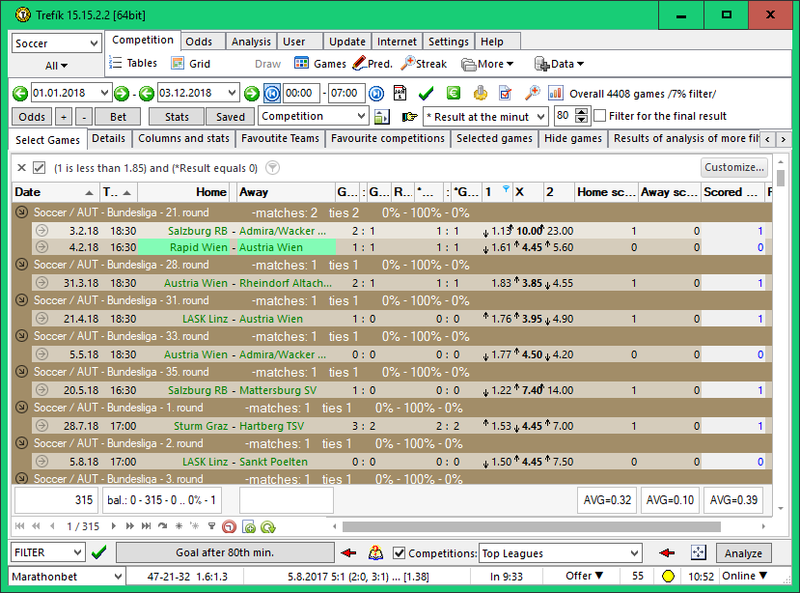 .. on the bottom right, aggregate data is visible on the bottom of the match list. These data can be defined by right mouse button (if the footer is visible - it must be activated in the right mouse button menu). The figure shows AVG, the average. Since the values in the columns are 0 and 1, we obtain the information on the representation of matches with the observed phenomenon by calculating the average. We can see that 24% of the matches scored home, in 19% of the matches scored by the guests and in 39% of the matches scored home or guests (= in the match, after 80 minutes scored). This gives us basic information about the goals scored after 80th minute. You can get more detailed information by using the features of the Offer window. This limitation matches we obtained statistics that the home teams scored after 80th minute in 30% of cases. We may also be interested in statistics where the home team is the favorite and at the same time it was the tie result in the 80th minute. 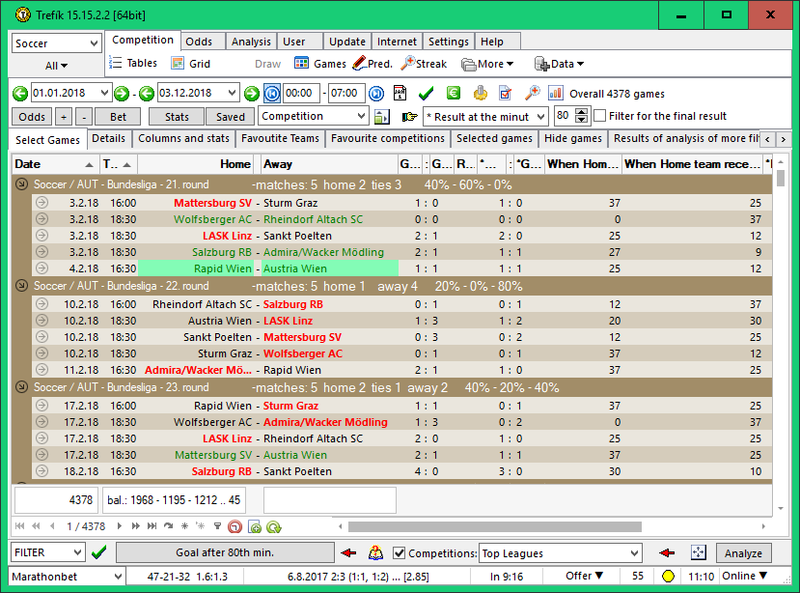 Here we get 32% matches with the home team scoring after 80th minute. We can also explore other contexts. Probably the number of matches when the home scorer was scored after 80 minutes, if the team was loosing for one goal. 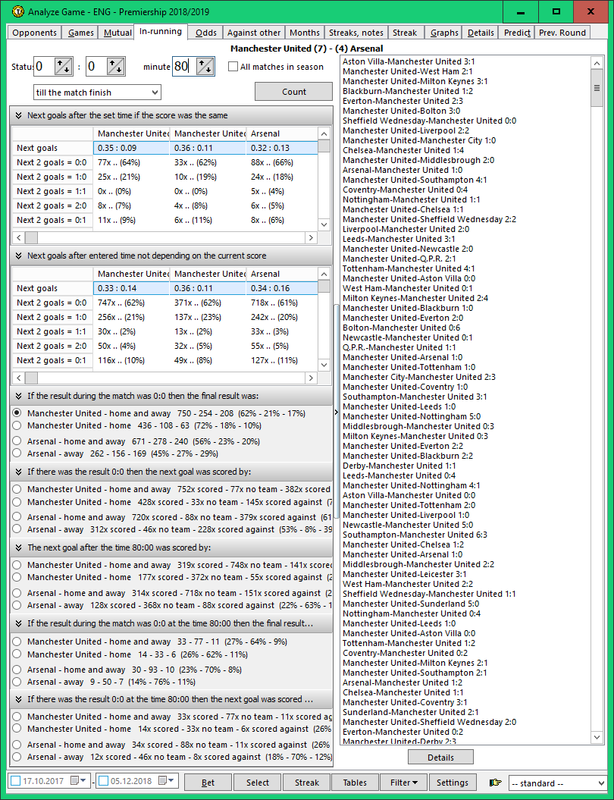 .. allowing other ways to filter and analyze matches. .. statistics for the selected "When Scored" competition, dividing minutes after 10 minutes. .. statistics for "When scored for" ... so goals scored by the team. 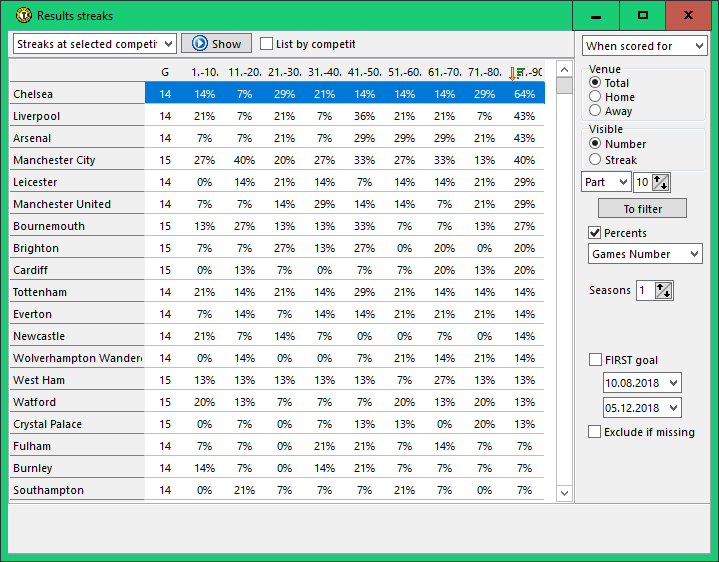 The 80th+ minute counts are higher than in earlier intervals, especially because the goals in the 80th minute interval are counted also in the added time interval (and the specified time is longer than the other segments).